Interactively browse, view and edit a PCB library component's constituent primitives. The PCB Library panel enables you to view the footprint model in the current PCB library document and edit its properties. When PCB footprint is active in the workspace , the panel becomes populated with information pertaining to the current library footprint and its constituent primitive objects. The panel also offers the ability to pass on any changes made to the footprint directly to the PCB design document. To open the PCB Library panel, ensure that a PCB Library footprint is the active document in the editor and click View | PCB Library | from the main ribbon menu. Panels can be configured to be floating in the editor space or docked to sides of the screen. If the PCB Library panel is currently in a group of Workspace panels, use the PCB Library tab located at the bottom of the panels to bring it to the front. The PCB Library panel becomes available when the component Footprint Editor is active, which is in turn instigated by adding or editing a footprint from CircuitMaker's Component Editor. The vault Component Editor is open when you have elected to build a new component or edit an existing component. See the Component Management in CircuitMaker page for more information. Components - The list of component footprints in the active library, which is a single entry for a vault component. The number of pads and primitive objects used to define the footprint is also listed. Component Primitives - The primitive objects, and their main properties, that make up the current component footprint. Mini-viewer window - A simplified, overall view of the current component, with the main editor view indicated by an overlay graphic. As the component is selected in the PCB Library panel, its constituent primitives populate the panel's Component Primitives section and the footprint is displayed in the main editor workspace. Selecting a primitive object in the panel causes the corresponding object to be highlighted in the editor workspace. In this way the PCB Library panel offers a fast and easy way to browse, view and access PCB library footprint primitives. A Track primitive selected and highlighted from the active component footprint. Double-clicking on the Component entry opens the PCB Library Component dialog, and double-clicking on a Component Primitives entry will access its corresponding Properties dialog - see more options in the Right-Click section below. Type - the type of primitive object (e.g. pad, track, arc, etc). Name - the specified value for the objects' designator (where one exists). X-Size - the X dimension of the object (e.g. the width of an arc, track or fill; the X-Size value of a pad). Y-Size - the Y dimension of the object (e.g. the height of a fill; the Y-Size value of a pad. This field will be empty for a track or arc). Layer - the layer upon which the object resides. As individual object primitives are selected in the panel, the matching object (track, arc, pad, etc) is graphically highlighted in the editor workspace. Selecting a component primitives highlights it in the editor workspace. Multiple entries can be selected using standard Ctrl+click and Shift+click techniques. Selecting an entry in the panel's Component Primitives list applies a filter, essentially using the entry as its scope. The visual result of the applied filtering on the document in the design editor window is determined by a series of highlighting controls located at the top of the panel. Mask / Dim / Normal - this dropdown list provides the options for visibly contrasting filtered and unfiltered objects within the design editor window. When this option is applied, unfiltered objects will be unavailable for selection or editing. To clear (reset) the current highlighting the workspace click the control group's Clear button – View | Highlight & Edit Mask | . Select - when enabled (default), the filtered objects will be selected in the workspace. Zoom - when enabled (default), the filtered objects will be zoomed and centered (where possible) in the design editor window. Clear Existing - when enabled (default), an existing filter will be cleared before applying a new one. Disabling this option allows you to extend an existing filter, essentially refining the filter further by applying a new filter in addition to the existing one. Use the panel's button to clear the currently-applied filter. All objects in the design workspace will become fully visible and available for selection/editing. If you wish to re-apply the filter, click on the button. The bottom section of the panel provides a mini-viewer for the active document, with an image of the component footprint central to its window. A white viewing box is imposed on the image, which represents the area currently displayed in the design editor window. The mini-viewer overlay represents the current editor wokspace view, but can also be used to control (zoom and pan) that main view. As you pan around the document in the design editor window – either through use of the associated horizontal and vertical scrollbars or the right-click panning hand – the viewing box in the panel will move accordingly. Conversely, if you click inside the viewing box and drag it around the footprint image in the panel, the document in the design editor window will be panned accordingly, and at the current zoom level. Clicking the button at the top of the panel will provide a floating magnifying glass and zoom cursor in the design editor window. As you move these around in the workspace, the mini-viewer in the panel will contain the magnified image of the active component footprint centered on the cursor. This allows you to browse the document at full size in the design editor window, whilst looking at zoomed detail in the mini-viewer window. Use the Page Up and Page Down keys to increase or decrease the magnification respectively. Right-click, click or press Esc to exit magnify mode. The Components section of the panel is always displayed. However the subsequent panel sections can be set to be displayed or hidden. When a section is currently displayed, the button will appear as . This will hide the section when clicked. When a section is currently hidden, the button will appear as . This will display the section when clicked. When multiple consecutive section are hidden, the button will appear as . Clicking the button will pop-up a menu allowing you to choose which section you wish to display again. Copy Name - copy the name of the component footprint to the PCB Library Editor's internal clipboard. Component Properties - access the PCB Library Component dialog, from where you can view/modify the Name, Height and Description for the component footprint. The PCB Library Component dialog will also open when the component entry is double-clicked in the panel. Place - place the current component footprint onto the PCB design document. When clicked, the last PCB to have been active (irrespective of the project it belongs to) will be made the active document in the design editor window and the Place Component dialog opens. 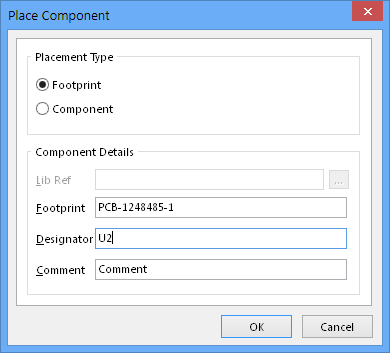 Use this dialog to define footprint designator and comment as required before placement into the design. Update PCB With <FocusedComponent> - pass on changes made to the current component footprint to all open PCB design documents where that component footprint has been placed. All instances of the footprint will be updated. Update PCB With All - pass on all changes made to component footprints within the library document, to all open PCB design documents where these component footprints have been placed. All placed instances of a changed component footprint will be updated. Delete All Grids And Guides in Library - use this command to delete all user-defined snap grids and guides from the workspace. The default snap grid will remain. Show Pads - enable to display pad entries in the Component Primitives section of the panel. Show Vias - enable to display via entries in the Component Primitives section of the panel. Show Tracks - enable to display track entries in the Component Primitives section of the panel. Show Arcs - enable to display arc entries in the Component Primitives section of the panel. Show Regions - enable to display region entries in the Component Primitives section of the panel. Show Component Bodies - enable to display component body (3D Body) entries in the Component Primitives section of the panel. Show Fills - enable to display fill entries in the Component Primitives section of the panel. Show Strings - enable to display string entries in the Component Primitives section of the panel. Select All - quickly select all component primitive entries in the list. Report - generate a primitive information report for the focused component footprint in the Components section of the panel. After launching the command, the Report Preview dialog will appear, containing the primitive information currently displayed in the Component Primitives section of the panel. Use the dialog to peruse, print and export the report in various file formats. Properties - access the corresponding Properties dialog for the focused component primitive, from where you can view/modify properties as required. The primitive's corresponding Properties dialog will also open when a primitive entry is double-clicked in the panel. Standard Ctrl+Click and Shift+Click functionality is supported for selection of multiple entries in a list. Ctrl+Click over a selected entry in a list to deselect it. If the entry is the only one selected for that section, performing this action will clear the filter. The keyboard shortcuts Up Arrow, Home, End and Down Arrow, can be used to display the previous, first, last and next panel entry respectively. The filtering applied when browsing design objects using the PCB Library panel is permanent. If the Mask or Dim highlight method has been selected, all objects not falling under the scope of the filter will become faded (depending on settings) in the workspace and are not available for selection or editing. Clicking inside the design editor window will not clear the filter. A permanent filter must be cleared by clicking on the Clear button from within the PCB Library panel, or using the Clear control from the main View ribbon. The component footprint that you paste into the active library document can originate from either a PCB design document or another PCB library document. If multiple components have been copied to the clipboard from the main design in the PCB Editor, only the last component of the group to have been selected will be pasted into the library document. A PCB design document must be open before a library component can be placed using the Place command. A PCB design document must be open in order to pass on changes made to component footprints in the library document. 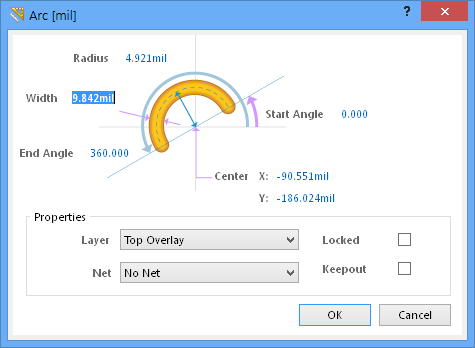 The attributes of pads and other graphical objects used to define the component footprint can be edited using the Inspector panel. Objects must be selected first in order for the panel to display the attributes.